Grand conclusion of Torah and starting anew from the book of Breishit - Genesis! Featuring 'Hakafot' dancing with the Torah, L'chaims and a delicious buffet! WrapStars Tefillin & Breakfast will not be held this Sunday, 9/30, as Tefillin are not worn during the holiday of Sukkot. We will back on next week! You can still RSVP: Dinner Under the Stars! Last chance to reserve for the annual Dinner Under the Stars! Enjoy a delicious holiday dinner and an exquisite Sukkot experience, held in our big, friendly Sukkah, under the Starry Texas Sky! Both the service and dinner will be held at the rabbi's home. Please reserve for address. If you cannot make it for the entire service, your are still welcome to stop by during that time to fulfill the special Mitzvah of Lulav and Etrog. Or join us for L'chaim, Cake & Shake (see in this email). Join us for guided services that are lively, inspiring and inclusive. Hebrew-English prayer books provided. No membership required. Optional High Holiday Reservation or Sponsorship is appreciated. We are pleased to once again provide you with the opportunity to have your very own Lulav & Etrog set for the holiday of Sukkot. Orders need to be placed as soon as possible to guarantee availability. 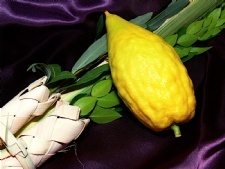 Order here (select "Lulav & Etrog Order" in the event drop down selection). Or reply to this email to reserve. WrapStars Tefillin and Breakfast will not be held this Sunday, Sept 9. It is customary to give Tzedakah before the Holy Days of Rosh Hashana and Yom Kippur. 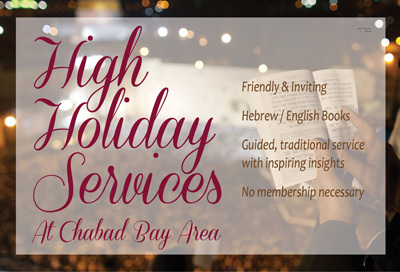 At this special time, please consider making a donation to Chabad of the Bay Area to join in our efforts providing warm and welcoming opportunities for Jewish living, learning and celebration to everyone. We thank you very much for your partnership and support! In the merit of your generous Tzedakah may G-d Bless you and yours with a good, sweet, healthy, happy and prosperous year! 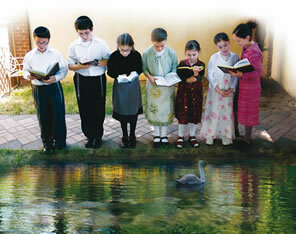 Join us on the first day of Rosh Hashana, Monday, Sept. 10, for the beautiful custom of "Tashlich." We'll be meeting at 5:30 pm outside Rabbi Yitzchok and Malky's home on Claiborne Dr. From there we will walk over together to Clear Creek.